Guest post by Mandi Ehman, founder of Life…Your Way. When it comes to helping kids help themselves, I think the biggest barrier we face as parents is that it’s often faster and easier to just to do it ourselves. But taking the time to get children involved when they’re young–and eager to help–is an important part of giving them the skills they need as they get older. After all, our job as parents is to raise productive adults, right? 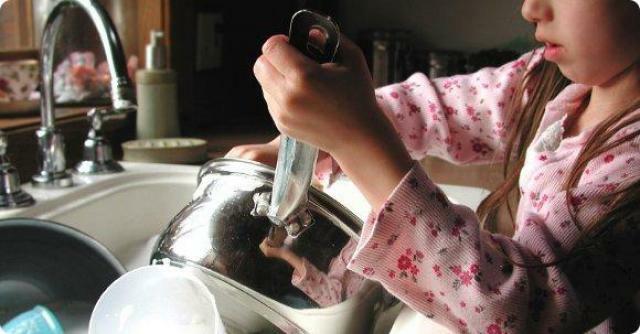 Daily and weekly chores also help teach our kids discipline and the importance of routines which will help them when they’re running their own households. It doesn’t mean they need to spend hours a day doing chores, but a few small chores lays the foundation for a myriad of life lessons–from practical skills to responsibility and contributing to the family unit. Two- and three-year-olds are especially eager to help with household chores, especially when you’re by their side. Rather than asking them to pick up toys and then walking away, make clean up fun by turning it into a game. Invite them to dust the lower shelves and furniture while you’re dusting the higher places. And praise them for pitching in with a happy heart! Four- and five-year-olds are capable of a lot more than we often give them credit for. Although it’s not a required chore in our home, my preschooler loves to show off her neatly made bed, and she’s a huge help at emptying trash cans, straightening the shoes by the front door and more! I’ve heard many mothers of older children say that everything gets easier when kids turn six or seven years old because they are suddenly able to really help in a way that makes a difference, and we’re already seeing this with our six-year-old. She is a great help and loves to be given responsibilities that her younger sisters don’t yet have. That’s not to say we never deal with bad attitudes when it comes to chores, but for the most part she’s still a willing helper! *Vinegar is an amazing natural cleaner and safer than traditional chemicals for children (and adults too!) to use. While eight year olds are certainly still kids and need plenty of time to play and just run free, they’re also able to help out around the house at an age appropriate level. Now is a great time to start teaching them to do laundry, cook simple dishes, take out the trash and more!